3-Piece Joseph's Studio Religious Holy Family Outdoor Christmas Nativity Set. From the Joseph's Studio 39" Nativity Collection. 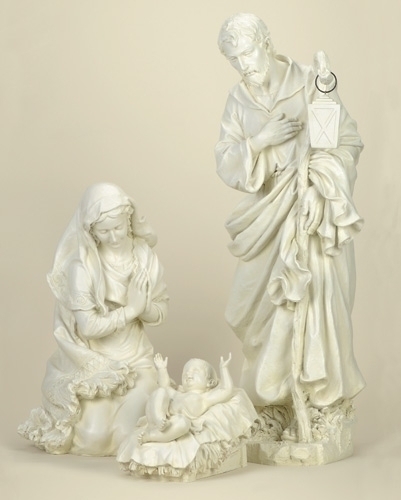 Set depicts the Holy Family - Mary and Joseph lovingly gazing upon their newborn son Jesus, as he lays in his crib. Meticulously sculpted and hand-painted by master artisans. Baby Jesus is not removable from the crib. Material(s): resin/stone mix. Intended for use with 39" scale nativity set.